Many people are telling me that they feel worse a few days or a week later after taking some medicines. Is this a side effect of the medicine or a “die-off reaction”? This feeling may just be normal. You can say that it is a side effect and a die-off reaction. For sure, many of you have experienced it before you got well. Also read article “PYRO-ENERGEN and Herxheimer Reaction or Die-Off Symptoms” . Many believe that “healing crisis” occurs when the body is detoxifying and releasing stored toxins from the bloodstream through waste bowels. Yes, the lymph, liver, kidneys, and colons clean the toxins in normal speed of body cycle. However, when our body is controlled by other force of process such as drugs or modern medical technologies to detoxify, the speed of releasing toxins in the body will occur suddenly. Then, we feel sudden changes in our body, which appears to be a side effect or what we call a die-off reaction. The process of cleansing and detoxifying is a process of elimination, but without medication, the body can eliminate toxins very slowly. Thus, without modern medication, we do not feel or we cannot determine whether we are getting well or worse in a short period time. Die-off reaction can also happen as the body replaces old, toxic tissues with new tissues. Die-off reaction may resemble flu symptoms like chills, fever, body aches, headaches, and rashes. As long as these symptoms are happening during a detox protocol, they are a natural part of the healing process and should be supported. If you take something like herbal medicines or other medical treatments, and you experience no healing crisis, it does not mean that the dosage or the medical treatments you are taking are too small or the treatment is bunk. Most Chinese herbal treatments and some modern treatments are made to work without die-off reactions. We just recommend that you drink plenty of water, vegetable juices, fruit juices, or mineral water. Also, regular light exercise is recommended. These will help minimize die-off reaction. Water is an important structural component of skin cartilage, tissues and organs. Every part of our body is dependent on water. Our body is comprised of around 75% water: the brain has 85%, blood is 90%, muscles are 75%, kidney is 82% and bones are 22% water. The functions of our glands and organs will eventually deteriorate without water. An average adult loses about 2.5 liters of water a day through perspiration, breathing and elimination. Symptoms of the body's deterioration begin to appear when the body loses 5% of its total water volume. In a healthy adult, this is seen as fatigue and general discomfort, whereas for an infant, it can be dehydrating. In an elderly person, 5% water loss causes the body's chemistry to become abnormal, especially if the percentage of electrolytes is overbalanced with sodium. One can usually see symptoms of aging, such as wrinkles, lethargy, and even disorientation. If your body is not sufficiently hydrated, the cells will draw water from your bloodstream, which will make your heart work harder. At the same time, the kidneys cannot purify the blood effectively. When this happens, some of the kidney's workload is passed on to the liver and other organs, which may cause them to be severely stressed and may develop health conditions such as constipation, dry and itchy skin, acne, nosebleeds, urinary tract infection, coughs, sneezing, sinus pressure, and headaches. So, how much water is enough for you? 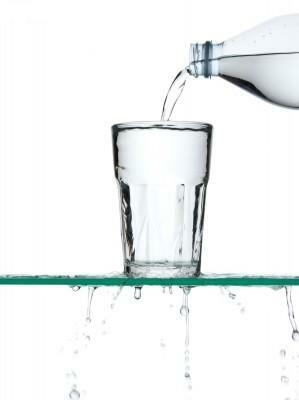 The recommended amount of water you need to drink is an ounce of water for every two pounds of body weight.